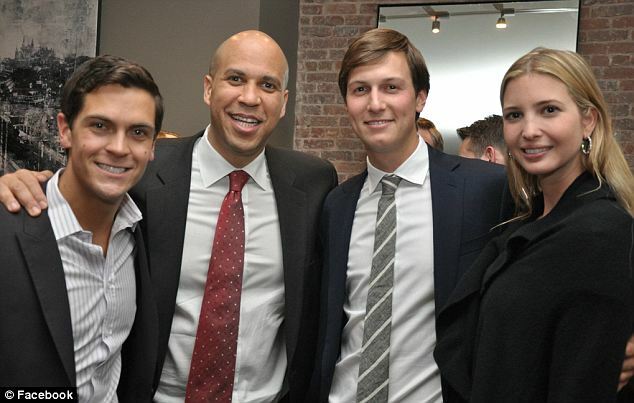 There was a time, not long ago, when politics did not separate Jared Kushner and New Jersey Democratic Sen. Cory Booker, but brought them together. Kushner, CEO of the real estate firm Kushner Companies and a son of Charles Kushner, formerly a major donor and power player in New Jersey Democratic politics, first backed Booker when he was mayor of Newark. From their political congruity, the two men quickly developed a personal friendship. Booker attended Kushner’s star-studded wedding in 2009 to Ivanka Trump, held at Trump National Golf Club in Bedminster, N.J. In 2011, Booker and Kushner were among the honorary hosts for a Freedom to Marry reception at the Manhattan home of Facebook co-founder Chris Hughes and his then-fiancé Sean Eldridge, another friend of Kushner’s; there, Eldridge, Booker, Kushner and Ivanka Trump posed together for a photo, grinning broadly. In 2013, Kushner bundled money for Booker’s Senate campaign, hosting a fundraiser for the candidate in Kushner’s penthouse at Trump Park Avenue. For months, however, Kushner and Booker have not spoken, according to a source close to Kushner. For one, Kushner, an orthodox Jew and a supporter of pro-Israel causes, was “really disappointed” when Booker supported the president’s Iran deal, the source said. But there is another awkward hang-up: Kushner is now advising the presumptive Republican nominee for president, his father-in-law, Donald Trump, whose political rhetoric, style and policy stances could not depart more sharply from Booker’s. "I know Donald Trump, I've met him, I know his family," Booker told Business Insider in February. "I have love, and friendship, and affection for his family members. But I'm going to work very hard to ensure that he is not our president." Booker’s Senate office did not respond to RealClearPolitics’ request for comment. Kushner, on the other hand, has offered Trump not only his support but also his counsel, emerging as a semi-regular fixture on the campaign trail and trusted hand in the process. On the night that Trump effectively locked up the GOP nomination with a victory in Indiana’s primary, the candidate gave a very public nod to his son-in-law, positioned prominently on his right flank and in full view of the assembled cameras. Since then, Kushner has not stepped away from Trump’s side. He was one of a few close advisers who accompanied Trump to his meetings earlier this month with House Speaker Paul Ryan and Senate Republican leaders. And Trump has assigned Kushner to map out a transition team to be put in place if Trump wins the presidency. Trump’s spokesperson did not respond to a request for comment. Kushner’s prominent role in a Republican presidential campaign is an unlikely project for the real estate developer, whose professional focus has been wholly in other spheres and whose personal views previously have been at odds with those being pushed by Trump on the campaign trail. Even stylistically, Kushner shares little with Trump: the former has built a reputation as quiet, hardworking, earnest and genuine. Although Kushner is registered to vote as unaffiliated with any political party, he and his family are lifelong financial backers and close allies of Democratic candidates in New Jersey and New York. Jared Kushner has not followed his father’s example as a political powerbroker, but he has nevertheless remained engaged on a smaller scale: In 2014 he donated $10,000 each to the New York and New Jersey Democratic state committees, in addition to supporting his friends Booker and Eldridge, who sought a congressional seat in upstate New York. Kushner’s professional moves, meanwhile, have vaulted him squarely into the center of New York high society and earned him broad respect in the real estate community. He purchased the New York Observer in 2006 for a reported $10 million, when he was just 25 and still in his second year of law school at New York University; in 2007, Kushner was named CEO of the real estate company his father founded and grew. Kushner Companies did more than $1.5 billion in transactions in 2015, according to a company spokesman. “You could argue [Kushner] is a more important player in New York real estate than Donald Trump is,” said one acquaintance. Unlike his bombastic father-in-law, who gained notoriety for and as a result of playing the New York City tabloids over the years, Kushner has taken a quieter approach and largely avoided that spotlight, even as the owner of a media property. “I quickly learned that there really wasn’t much benefit to being out there,” The New York Times quoted him as saying in 2011. But Kushner’s newspaper has been an asset to the Trump campaign. When it came time in March to craft a speech for Trump to deliver to the pro-Israel lobbying group AIPAC earlier this year, Kushner sought input from Observer Editor Ken Kurson, a personal friend and a former speechwriter for Rudy Giuliani. Kushner understands well the perils and complexities of a family business and politics. His father was sent to prison in 2005 after pleading guilty to 18 counts involving illegal campaign donations, tax evasion and witness tampering. As the elder Kushner served a year in prison, Jared flew weekly to Alabama to visit him. If those values might begin to explain Jared Kushner’s involvement in his father-in-law’s campaign, ditto for Charles Kushner: Last year the former Democratic donor hosted a meet-and-greet with Trump at his home in New Jersey, afterward donating $100,000 to a pro-Trump super PAC. In a 2004 profile by New York Magazine, Jared Kushner discussed one of his favorite photographs, which then hung in his office: a Garry Winogrand shot of John F. Kennedy at the 1960 Democratic National Convention, delivering his speech to accept the nomination for president. He is shown from behind, gesturing with his right hand toward the crowd; his face is visible only from a small, bright television monitor in the foreground. Kushner might soon be afforded a similar view, not of the Democratic nominee but of Trump at the Republican convention in Cleveland, from Kushner’s unlikely, accidental perch at the center of the campaign. Rebecca Berg is a national political reporter for RealClearPolitics. She can be reached at rberg@realclearpolitics.com.